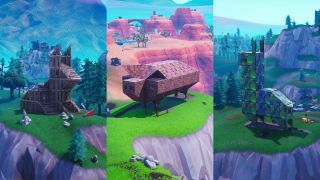 All the way back at the start of Season 3, the first ever Fortnite Battle Pass Challenges were released, one of which involved visiting three different giant animals around the island. The world of Fortnite as we know it has changed so much since then, but one thing that has remained consistent is the presence of sculpted creatures such as these scattered across the map. The animals themselves have changed, and for the new challenge in Week 6 of Season 8 you need to track down a wooden rabbit, a stone pig, and a metal llama in order to tick off all of the requirements. Helpfully, we've already found them all, so read on and we'll show you the locations you need to visit. As you can see from the map above, all the animal sculptures are found along the coastline of the island. If you want more specific details for finding the wooden rabbit, stone pig, and metal llama then we have all the information for you down below. The wooden rabbit, complete with its own brick carrot and literal bushy tail, is found just to the north of Snobby Shores. It sits on a small hill next to one of the houses on the path leading north to Haunted Hills. Stone pig, stone pig, does whatever a stone pig does... The stone pig stands right down on the south coast, just southeast of Lucky Landing. If you haven't visited all of the Fortnite furthest North, South, East, and West points yet then you'll also find the furthest south point here. A llama has stood at this location northwest of Junk Junction for a while now, although it has had its material upgraded from wood to metal during that time. Again, if you still need to visit the furthest points on the island then the furthest north point is just along the path from here.